I first heard of Victor Davis Hanson when Rush Limbaugh referred to him several years ago. After Rush mentioned him, I googled Victor Davis Hanson and found many, many articles written by him. Soon I learned he was a raisin farmer living in California who is also an ancient Greek author and historian. He seems to be a man who loves, defends and teaches about Western culture. Naturally, I became a fan of his and began to somewhat regularly read his articles posted on the Internet. Soon I became interested in reading some of his books. But like many, I was very intimidated about picking up any of his books because they all seemed to require knowledge about ancient Greek history. Like many of the books in my library, I happened upon one of his books at Half-Priced Books. I bought it and put it on the shelf. By the time I finished The Chess Artist, I was in a good situation for regular reading (by riding the bus for 2 hours every day). So I tossed A War Like No Other in my bag one morning and opened it on the bus and began reading. What was amazing to me was how easily Hanson made it to read ancient Greek history. Soon I was several chapters into the book and I was genuinely hooked. As I lacked a lot of background knowledge and information on the Peloponnesian War, I referred to the Wikipedia entry quite a bit to get an overview of what happened in that war. I won't go into details about the book since it has been a month or so since I finished reading it, but I will say that this books seemed to have opened up a whole new world for me. I had dipped my toes into ancient Greece while taking history of civilization requirements in college, but I never really got into it that much. 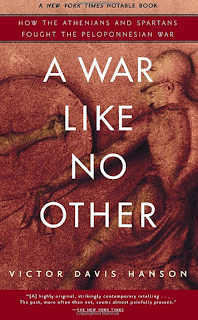 But while reading this book, I became fascinated with how wars were fought and how the two cultures of Athens and Sparta collided in that seemingly never-ending war. I enjoyed this book so much, every time we got to Half-Priced Books, instead of heading right to the chess section, I now head to the history section and look for Victor Davis Hanson books. On our last trip, I landed two VDH books and one general ancient Greek history book (along with a book about the golden age of piracy). So for the next several months, I'll be reading and learning about ancient Greece and reading VDH.